“Imagine a pink elephant flying in circles,” I told her once. “I don’t understand,” she replied. “It’s a cute idea, but there’s no such thing.” We were somewhere in that grove of pine trees talking about life in general – random things – when I brought the subject up. An awkward moment of silence ensued. We’ve never really been more than friends; if we were, it’s the kind of high school “I-like-you-and-you-like-me” relationship in a college setting. It was a rather shy acknowledgement, too. I guess that when you remain shy or stay too emotional for it for too long, nothing really happens. For the most part there’s the quick hello, a quick wave. Text messages at 12 midnight; emotional exchanges, sometimes. Gifts. Text messages. Emails. Love letters. Shy looks. Talks, conversations under pine trees. Lunches. Dinner dates. Some dwell in the past, some waste away the present. Hope, I guess, is something reserved for – and only for the future. So nothing really happened. “A special place in my heart,” at least, yet it still gets a bit awkward. We moved on our separate ways, had separate lives. The awkwardness of it all is gone. There’s nothing to talk about, there are lessons learned. Just friendly exchanges between friendly friends. Past has passed, and we only have the future to look forward to. “Wanna hang out?” she asked one day. 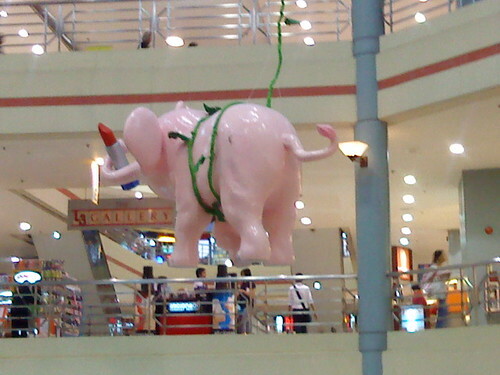 I stared at the pink elephant at the mall. It certainly wasn’t a real pink elephant; it was just papier mâché painted pink, suspended above the gallery with wires and rope. Given a bit of imagination, even that thing can fly. I felt a faint smile forming on the corners of my lips as I walked back down the stairs.